Tunnel vision is almost always a risky approach to investing, however, this is one of those rare times where tunnel vision is actually the best way to go. With tunnel vision I mean focusing on the (only) indicator that’s been working, and tuning out all other indicators. Elliott Wave Theory (EWT) has been the indicator deserving of investors’ focus. EWT (interpreted correctly) has persistently pointed to higher prices. 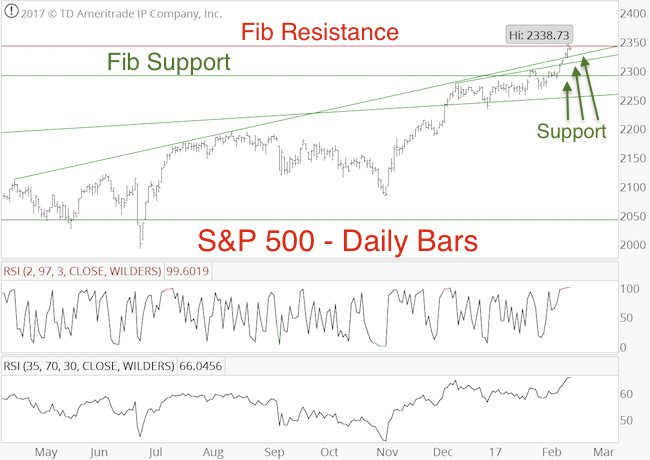 Months before the Trump rally, EWT strongly suggested a S&P 500 rally into the mid 2,300s and higher (original price projection was published here: S&P 500 Update – Expect the Abnormal). 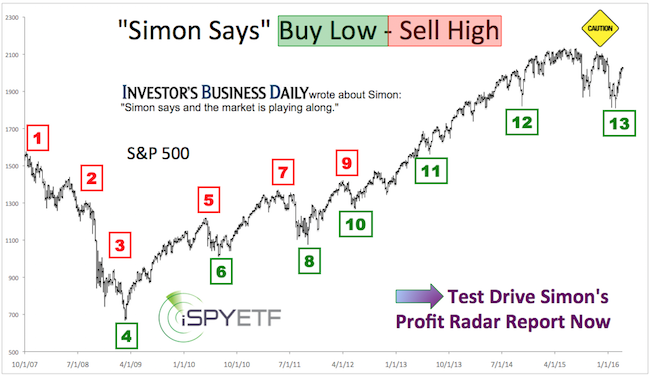 Barron’s rates iSPYETF as “trader with a good track record” and Investor’s Bussines Daily says “When Simon says, the market listens.” Find out why Barron’s and IBD endorse Simon Maierhofer’s Profit Radar Report. To maintain a diversified research and forecasting approach, the Profit Radar Report looks at the most potent indicators and never relies solely on any one indicator. Today’s push to new all-time highs erased (almost) all larger bearish divergences, and synchronizes EWT more with many other indicators (only cycles are short-term bearish). The weight of evidence points to more strength ahead (2 steps forward, 1 step back, as outlined by the January 4 Profit Radar Report). Any pauses caused by overbought conditions or investors sentiment should be short-term in nature. Next resistance (and chance for a pullback/pause) is around 2,342. Support is at 2,320, 2,300 and 2,285 (see chart). At some point in 2017 however, we should see either a major market top or a 15% correction. More detail is available in the multiple-indicator based 2017 S&P 500 Forecast. Wal-Mart is known for rigorous pricing, swallowing up market share and frustrating competition. The Wal-Mart of the ETF market place is going about business almost the same way, but this Wal-mart can’t offer everything. The ETF market place offers many exotic choices, such as a Global Carbon ETF, Forensic Accounting ETF, and IPO ETF, but that’s not what makes ETFs attractive and efficient. Yes, BMW may build an electric car, but their flagship product is the ultimate driving machine. The flagship ETF product is a plain and simple index ETF. Who builds the best index ETF? Since 2010, Vanguards index ETF market share has grown from 15 to 20% while iShares (owned by BlackRock) and State Street bemoan small losses (datasource: Bloomberg). In 2013 Vanguard ETFs grew by $51 billion, receiving 32 cents of every dollar invested. The average Vanguard ETF has an expense ratio of 0.14%, compared with 0.35% for State Street’s SPDRs and 0.39% for iShares’ ETFs. This is not a true apples to apples fee comparison, as State Street and iShares offer some more specialized ETFs with higher fees. What about the most popular S&P 500 ETF? The bellwether SPDR S&P 500 ETF (NYSEArca: SPY) has an expense ratio of 0.11%. The iShares Core S&P 500 ETF (NYSEArca: IVV) comes in at 0.07%, while the Vanguard S&P 500 ETF (NYSEArca: VOO) has a price tag of 0.05%. As per its patent, Vanguard is able to pool mutual fund and ETF assets and issue different shares (such as ETF). As a result, Vanguard ETFs provide a more pure representation of the underlying index. On average, iShares ETF hold 312 securities, State Street ETFs 308, and Vanguard ETFs 1,171. Unlike iShares and BlackRock, Vanguard is not a publicly traded company and doesn’t have to worry about pleasing Wall Street. … you buy at the wrong time. Even if you have the best-in-class product, you will still lose money if you buy at the wrong time. Neither State Street, nor iShares or Vanguard will tell you when to buy (chances are any advisor will always tell you now is the best time to buy). When is the right time to buy? Here are a few tips. Simon Maierhofer is the publisher of the Profit Radar Report. The Profit Radar Report presents complex market analysis (stocks, gold, silver, euro and bonds) in an easy format. Technical analysis, sentiment indicators, seasonal patterns and common sense are all wrapped up into two or more easy-to-read weekly updates. We are accountable for our work, because we track every recommendation (see track record below).